As the New Year approaches it is time for Galway to look ahead towards new resolutions and experiences. For those searching for something different on a Sunday evening, the Galway Film Society has announced its winter and spring schedule of screenings taking place in the Town Hall Theatre from January 19 to March 23. This year the GFS has put together an eclectic lineup of films from Ireland, France, Mexico, Japan, Belgium, Chile, Germany, and Romania; a wonderful cross section of some of the most exciting film industries in the world, showcasing award-winning features which are sure to challenge and inspire audiences. Beginning on January 19 at 8pm, the GFS introduces Le Week-End, a British drama film directed by Roger Mitchell starring Academy award winner Jim Broadbent, Olivier Award winner Lindsay Duncan, and the familiar face of Jeff Goldblum. 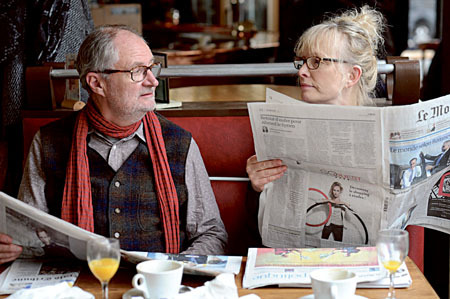 Broadbent and Duncan play a middle-aged, middle-class, couple who visit Paris for a long weekend in hopes of rekindling their relationship, or perhaps to bring it to an end. Diffident, wistful, Nick and demanding, take-charge, Meg move from harmony to disharmony to resignation and back again as they take stock and grapple with love, loss, regret, and disappointment, in their own very English way. When they accept a dinner invitation from Nick’s old friend Morgan (Goldblum ), an American academic superstar with a fancy Parisian address, their squabbles rise to a register that is both emotionally rich and very funny. Le Weekend is full of surprises. The dialogue digs into the tensions that shape this couple’s relationship, holding nothing back. Director Roger Mitchell (Notting Hill ) has shown the pleasures of complicated romance before, but never has his filmmaking felt freer. From the charged scenes at the hotel, to Goldblum’s delicious intervention, this is one of the most enjoyable love stories of the year. Going coast to coast with ThereisBear! Shuffle’s New Year’s Eve Shindig! . Page generated in 0.1780 seconds.